Gu have changed their boxes, but not the contents, for Valentine’s Day. Being a time for couples, the boxes with their pairs are perfect. But which one to buy for the big day? 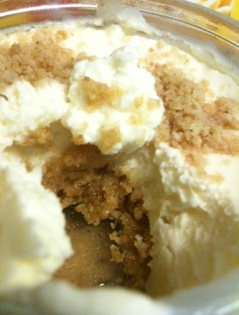 Lemon cheesecake – this is more for the non-traditionalists. Those who are perhaps more health conscious as it has lemon in it so must count towards your 5 a day. Must… gotta… somehow. 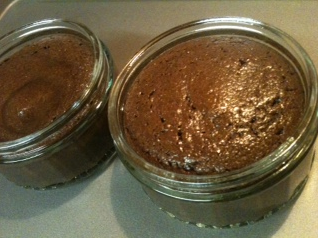 Also the biscuit base is lighter than the chocolate and the whole pudding has a lovely flavour. I liked the lovely light flavour of the cheesecake. Chocolate and Vanilla Cheesecake – less tangy than the lemon, this is more about chocolate and dense thick yumminess. 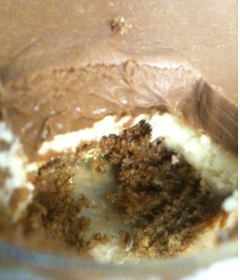 The chocolate crumb base is more flavourful, with the chocolate having a thicker denser flavour than the lemon. This is another yummy Gu pud and with two in the box, if you’re more into chocolate than fruit, you can pick this one. Hot Chocolate Souffle – I have to admit, with this being all chocolate, and hot, I expected to like this best but I didn’t. It was light, airy with a melting middle and a light almost mousy cake. The light exterior and melting middle left me wanting more. And this is a problem when you’ve already given the other to your husband. Generally he shares but he didn’t. That is a problem. Perhaps a 4 box would help solve the problem. You can get these ribbon-wrapped puddings in most supermarkets.